The legendary comic artist and sci-fi / fantasy illustrator Jean (Moebius) Giraud died of cancer today at the age of 73. 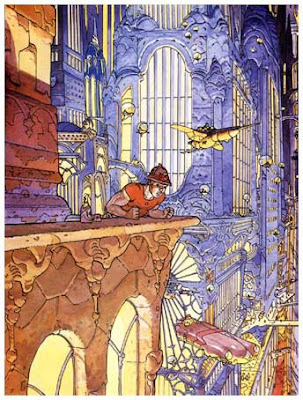 Moebius had a unique and influential imagination, shaping the look of the films Alien, Blade Runner, and Tron. His own comics Arzach (later "Arzak"), Blueberry, and The Airtight Garage are full invention, blending a mystical vision with down-to-earth details. Many of his early works were full of baroque detail and cross-hatching; later, he strove for a simplified elegance. He had a prodigious drawing ability, improvising all sorts of characters in all kinds of angles and actions without any reference. This news comes right on the heels of the passing of Star Wars film designer Ralph McQuarrie, another huge influence on me when I was starting out. (Video Link) Here's a vintage film of Moebius drawing together with Hugo Pratt. He was one of my all-time big, big heroes. My high school latin teacher was really fond of him too. When I was 17, if somebody had asked med what I wanted to do when I grew up, I would have pointed at "Jerry Cornelius' Airtight Garage" and said "Something like that". Thanks for the video - so amazing to watch those amazing drawings grow out of the hands of those two masters so effortlessly. Hang in there, Syd Mead! Cherbourg, Normandie, France had a wonderful retrospective exhibition on his work and it showed how Moebius learnt to use all media including digital tools. Goodbye Mr Moebis. Salut l'Artiste. There is an excellent documentary about Moebius, titled "Moebius Redux: A Life in Pictures, (2007)." I got my copy of this film from a friend, however, it appears that it is now up on youtube. A must-see for Moebius fans. First McQuarrie and now Moebius. The legends are departing. I am still under the shock of the news. Moebius was part of the three artists I always mentioned as the ones "who started it all" for me. I've been a fan since I was about ten. I discovered Corto Maltese later in life but Pratt also is a big influence. I'm going to make a little homage for Moebius. I guess I need that. Strange, the older he got, the more I could relate to his style. Wonder what he could have made if he'd have had more time.